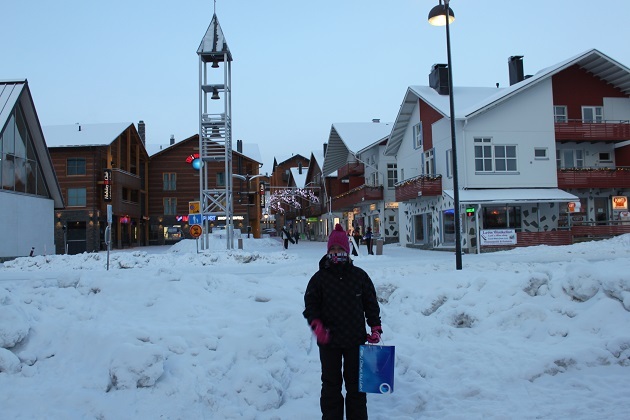 170km north of the Arctic Circle is the little winter resort town of Levi – our base for this Lapland holiday. 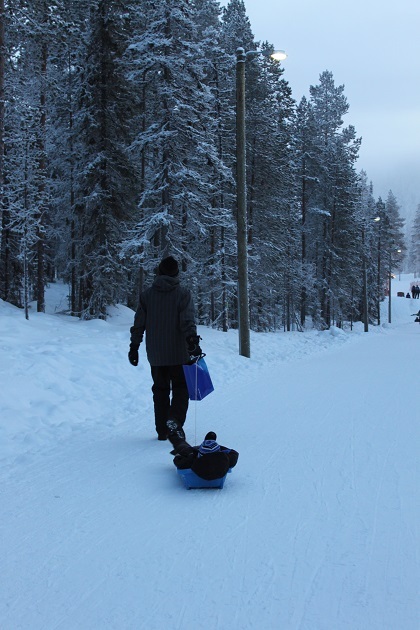 The atmosphere is warm and friendly, it is picture postcard perfect and although it is Finland’s most famous ski resort, we found it quiet, calm and just the best place to chill and relax before Christmas. 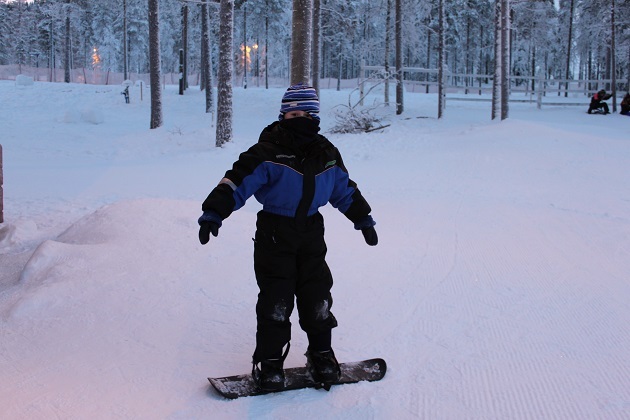 An added bonus for us was the main airport at Kitilla is fifteen minutes drive away, no long transfers, straight off the plane and straight into all kinds of snowy fun. There are stacks of activities available here, everything from snowmobiling to husky sledging, it is a downhill ski resort but the area around the town is relatively flat so we saw plenty of cross country skiers out and about as well. 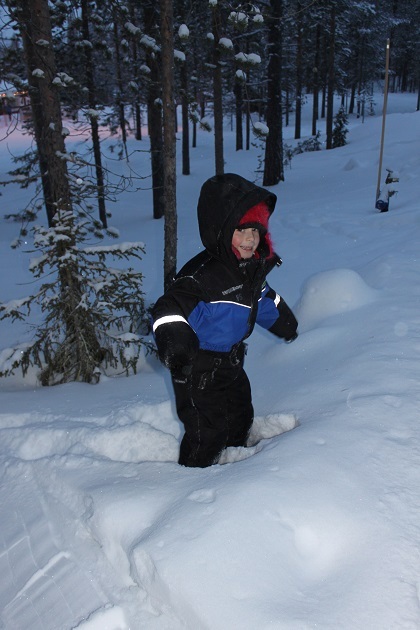 Levi experiences the polar night when the sun doesn’t rise in late December. We were there earlier in the month so did have a few hours of daylight. Most nights during our visit the skies were clear and we found after sunset, rather than being pitch black the sky had a bluey twilight effect which is just magical. The sun rose at 10am and set around 1.30pm every day, quite a strange feeling but it made me realise we were in an unusual and special place. Unsurprisingly this town is so well equipped for those low temperatures and short days. 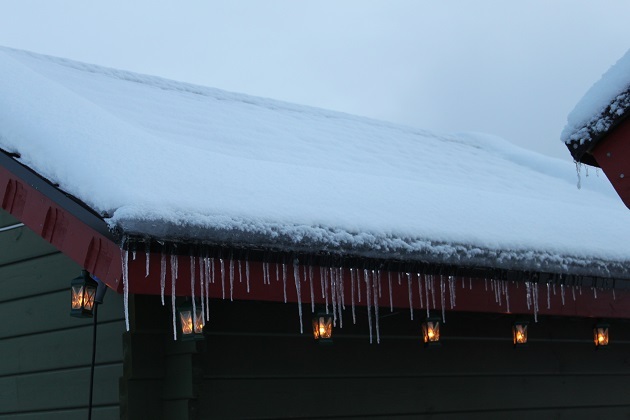 The slopes and pistes are floodlit and the accommodation, shops and restaurants are all toasty inside. Plenty of lovely restaurants around too with various offerings to suit all budgets and tastes – most though do serve a lot of fish and reindeer. We ate out a handful of times, a half-board package at the hotel and the hassle of getting everyone togged up in multiple layers to trek through the snow meant we took the easier option mostly of dining at the hotel. When we did venture out though we were definitely not disappointed. Cute, quirky restaurants full of charm and character are the order of the day here, not a chain in sight. 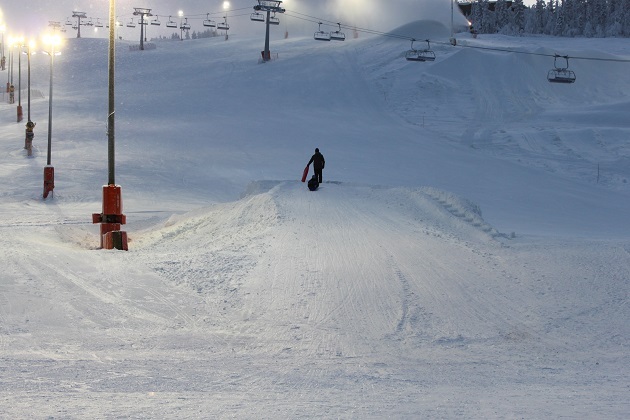 Skiing and snowboarding are popular here – it’s a great intermediate and beginner resort although it does have a World Cup black run too. Husband and I have skied here twice, it suited us down to the ground, not least the instructors who (in my opinion) are second to none and far preferable to experiences we’ve had in the Alps. We didn’t ski on this trip, no time and far too many other things to do one of which was sledging. This was a daily thing, every evening and some afternoons we set off, grabbed a sledge and hours of fun were had. No need to buy or acquire your own here, there are sledges lying around by the roadside and close to the slopes. You just take one, use it and then leave it when you’ve finished for someone else. We never found a shortage and discovered they were handy too for transporting shopping and even tired small children around. The slopes were pretty much empty of skiiers and snowboarders by around 6pm so sledging took over from then on. Kids Land at the side of Levi Fell was one of our favourite spots. As well as offering ski lessons here, there were three or four wooden cabins with free of charge children’s activities going on every day. 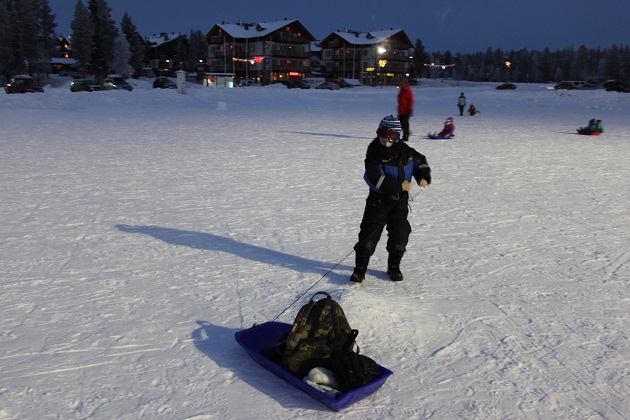 There is also a gentle and safe slope and loads of interesting sledges of different types to try out. 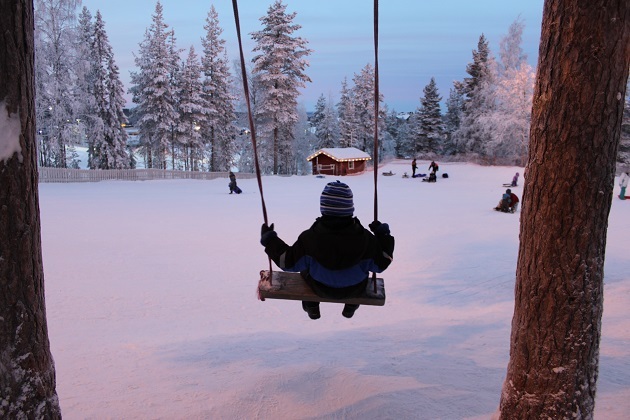 Add to that snowshoes (large and mini sizes), small snowboards and stacks of snow toys mixed with music playing on loudspeakers and you have the most fun and atmospheric place to spend the afternoon with children. Plenty of cute as can be shops selling no end of tempting souvenirs and high quality items – I was happy with that, a bowling alley where we spent a great evening and Levi had just about everything we could have wanted – we all agreed it was the most perfect winter resort. this looks amazing! do you have details of who you booked with, how much etc? It is the most incredible holiday – everything was just magical for us. We booked with Inghams via their website, no idea of the cost, just it isn’t cheap and that was 6 years ago. It was definitely worth it though! That sounds so good. Love to do something like this when kids are older. Did you visit ‘Santa’/’Rudolph’- did i miss that post? It is incredible, one of the most memorable holidays we’ve ever done. 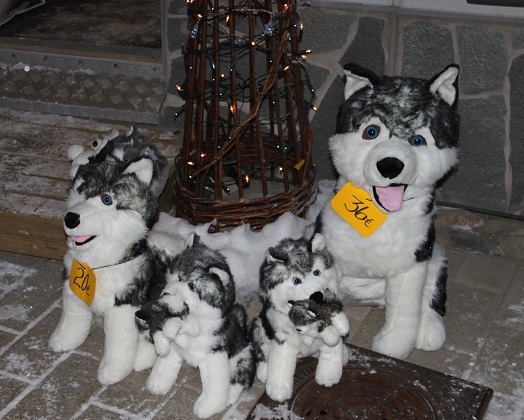 We did see Santa – twice – those posts are coming up so you didn’t miss anything!! Better luck with the northern lights next time. I can’t see that ‘help yourself to a free sledge’ taking off in England – they’d all get vandalised! You could barely leave the sledge in your front garden here and be sure it would be there the next morning!! It looks like an absolutely beautiful place! Thank you for sharing! It is so special and magical, definitely a winter wonderland. We absolutely loved it there, can’t stress how much fun it was and the atmosphere was just incredible. Definitely put it on the list!! It’s a really magical trip with children before Christmas, but we went twice before our son was born and loved it then too! It’s so beautiful and there are so many things to do and see. Definitely recommend it!! I love your Finland posts! Glad you stepped out into this “iceland”. I understand that struggle with all the clothing when going in- and outside! Thank you Erika – it was a bit of a hassle getting multiple layers and coats, hats, waterproofs on and off every time we went in and out, plus I had to sort our son out then too. Would be easier now he could sort himself out!! Absolutely! But even then…. it is a pain. But to tell from your pictures absolutely worth it! There aren’t too many places like that left unfortunately – I love it when the shops and restaurants are unrecognisable, such a refreshing change!! 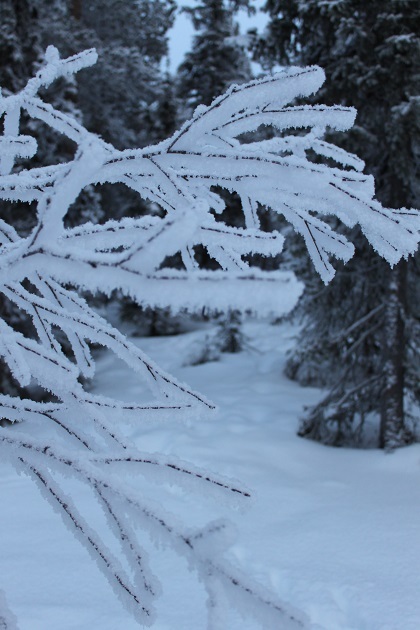 Cool post and wonderful winter photos. Thank you – it is a real winter wonderland. Great pix & good info! Thanks! Thanks for dropping by and commenting!! As much as we complain about winter here in Canada, I can’t imagine not having snow! And the northern lights we get here are spectacular, so I really hope you get to see some one day!! 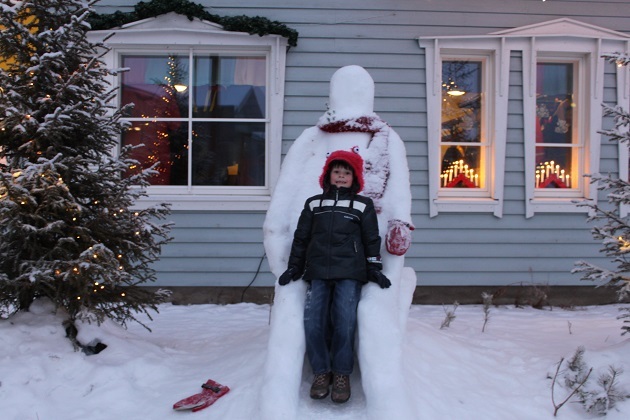 Great post, makes me want to go sledding with the kids today! I am so jealous, snow and the Northern Lights sounds simply amazing at the best of times, but with our current wet, mild and soggy UK weather even better!! Love love love! How old is ur son?? It’s such a great place for sure Linda. 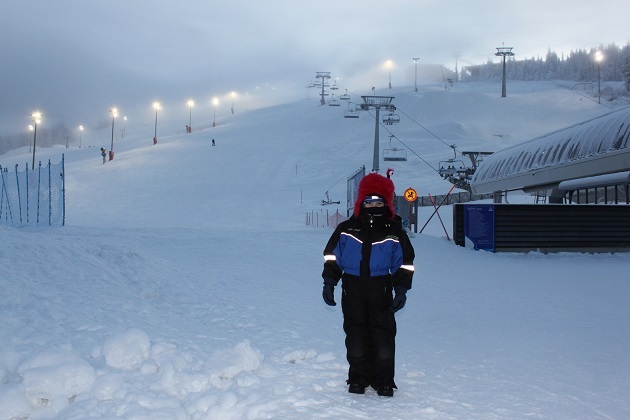 He is 12 now but we did this trip when he was 6 – the perfect age for it. Oh I wish Linda!! We travel as much as we can during school holidays but that’s it!! It might seem more, I’m trying to put up trips we’ve taken in the past as well on the blog so we have something to look back on, maybe that’s why it seems like we travel more!! This place looks beautiful, Joy. I wonder how I would do with so little daylight. How did you do with just a few hours and have you been somewhere where there was no daylight? Never been to a no daylight place George, here we had about 3 hours which sounds odd and unsettling but actually once we were here it was no problem at all. I think the snow brightens the whole place anyway so it never seems really dark and it was always cheerful. 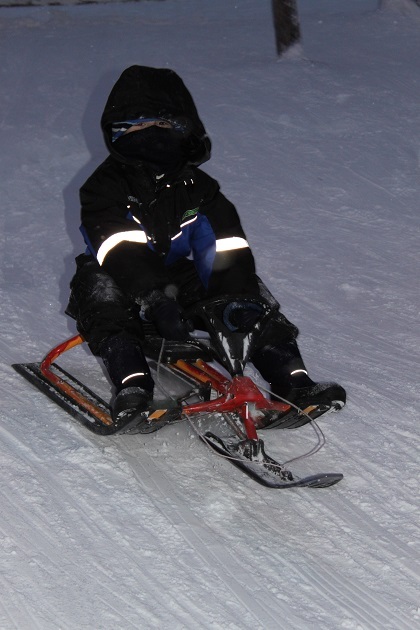 Also we went out sledging most evenings and all the pistes and slopes are so well floodlit. One good thing too not sure if it was due to the short daylight hours but we all slept like logs…maybe we were in hibernation mode. This looks like a fantastic trip. We’ve been well north of the Arctic Circle but in Alaska and only in the summertime so we had the opposite experience of day and night with the sun never really setting. I too have wanted to see the northern lights but your experience on this trip sounds like it was wonderful even without the Northern lights. 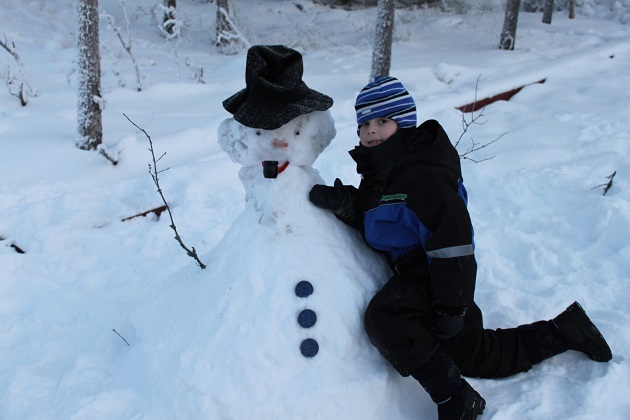 We’ve been watching some travel programmes on television about Alaska thoroughly captivated by this incredible place – maybe one day….. We had midsummer once in Helsinki with constant daylight, I loved that. Those Northern Lights have proved elusive but it’s true, this was such a wonderful holiday it didn’t really matter. Thanks for taking me along on this trip of a “winter wonderland”! So ,cut fun, Joy! Thanks for coming along Pam! It really is a winter wonderland, such a special place. It looks to have been a pretty magical trip. What a shame you did not see the Aurora Borealis there as that would have added to the magic. Have you seen them elsewhere? I have seen them from the north of mainland Scotland and also where we used to live in Argyll. Never seen them Laura, never been lucky enough…. This place looks amazing – and the 1:30 sun set sounds mysterious and exciting! It was nice to read this post ESP since here in NY it’s 60 degrees and no snow coming in site for a while..not a very Christmas-y vibe around here..
Oh I completely empathise – it is far too mild here at the moment, unbelievably so and just wet, damp and miserable. Nothing like Christmas should be…. It seems like the perfect location to enjoy some relaxing time. 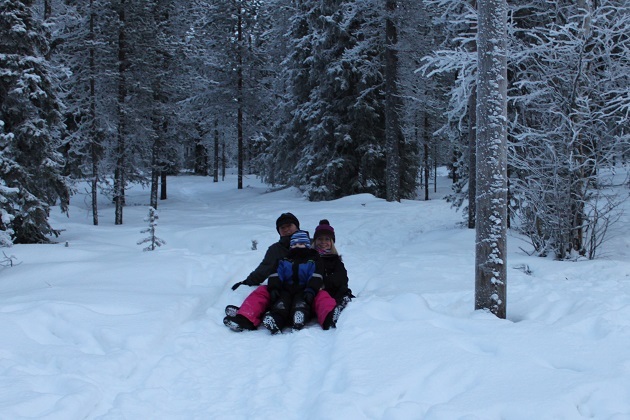 They other day we were reflecting on our holiday in lapland and we thought it was one of our best winter ones. It was very layback and relaxing and we enjoyed ourselves immensely. We thought exactly the same about this holiday being one of our best wintery ones and also about the relaxation thing. I felt more chilled out than I ever normally do…maybe it was those long dark days put you in hibernation mode and slow everything down!! 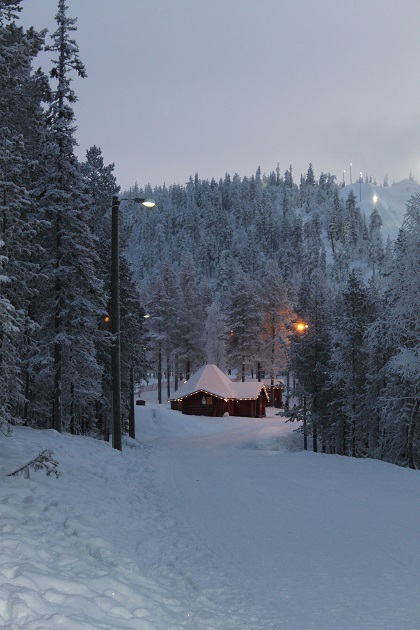 I absolutely love Finnish Lapland, everywhere you go it is like a Christmas card image. Lovely pictures! It is just gorgeous, we loved everything about it too – such a special place!! We’re having a succession of friends over this weekend Rosemary, so very busy and hectic but it should be nice. School has finished so we’re all getting into the Christmas mood. Nice to look back at these photos though and remember that trip – our son keeps asking can we go back next year!! Best wishes to you and your family for Christmas and 2016 as well!